Is it because of Halloween? Yeah, I think it's because of the upcoming new Halloween film that everyone who's loved John Carpenter films for many years -- who remembers first hearing about him when Dark Star debuted? Hands up! -- has been making an extra effort to inform everyone else about the greatness of his films. And so, the beloved (already) Popcorn Frights Wicked Weekend "will open with a newly restored 40th-anniversary presentation of Halloween on Thursday, October 4," according to a news release, "and continue for the next three nights with special presentations of Christine for its 35th-anniversary, a new restoration of The Thing, and They Live for its 30th-anniversary." You know what's wild? The fourth Popcorn Frights Film Festival just concluded last week! Yup, dedicated movie fans are putting this all together, so let's give them a hand! The lovely event poster (designed by True Horror) is also visible on this page, and below is more official verbiage. And below that is a link to the Wicked Weekend trailer (edited by Chris White). Popcorn Frights is proud to announce its inaugural Wicked Weekend event celebrating the Master of Horror John Carpenter. From October 4-7, 2018, four of John Carpenter's iconic genre films will be presented featuring special immersive theater performances and surprise giveaways. Popcorn Frights Wicked Weekend will open with a newly restored 40th-anniversary presentation of Halloween on Thursday, October 4, and continue for the next three nights with special presentations of Christine for its 35th-anniversary, a new restoration of The Thing, and They Live for its 30th-anniversary. All screenings will take place exclusively at the historic Savor Cinema theater, a South Florida landmark that in the 1940s was a Methodist Church. Wicked Weekend is a new annual event hosted by Popcorn Frights shining a spotlight on a legendary genre figure. This year marks the perfect occasion to honor John Carpenter, not only as he recently celebrated a 70th birthday, but because of the worldwide excitement surrounding the release of the new Halloween sequel which he is producing and composing new original music for. 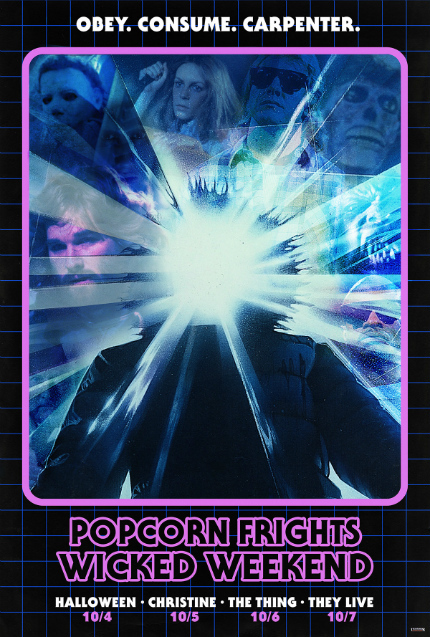 Follow Popcorn Frights on Facebook (/popcornfrights), Twitter (@popcornfrights), or Instagram (@popcornfrights) for updates with the latest information. Join the conversation using the hashtag #popcornfrights on social media. Popcorn Frights has been named "One of the Best Film Festivals in Florida" by The Sun-Sentinel and is the largest genre film festival in Southeast United States. Popcorn Frights special focus on discovering new talent and recognizing established filmmakers has made it a natural gateway for the best in genre films from around the world. Have Your Say: Will You Be Watching HALLOWEEN Tonight?